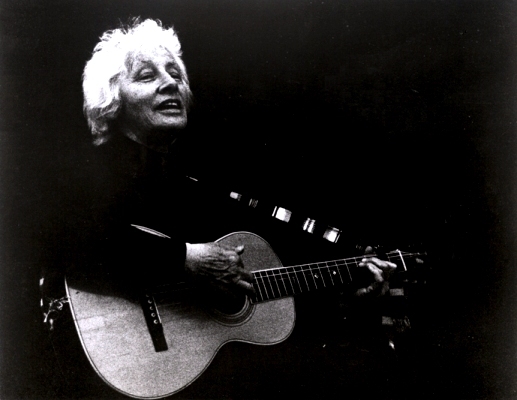 Malvina Reynolds’ songs have found their way into the repertory of entertainers, protesters, teachers, parents, and children all around the world. In this service the focus is on her song lyrics and poetry, but we also provide links to biographical and historical information about Malvina, her songs, and her life. Malvina Reynolds was born Malvina Milder on August 23, 1900, to a Jewish socialist immigrant family in San Francisco, California. Her parents ran a tailor shop together and their home was filled with political discussion and meetings. Due to her parents’ opposition to the first World War, Lowell High School denied her a high school diploma, but her teachers at Lowell helped her get into the University of California at Berkeley anyway. There she earned both her Bachelor's and Master's degrees, and later, in 1938, her Ph.D. in Romance Philology. Jews and women had a harder time getting good jobs then than now, and throughout the Depression and following years Malvina was unable to find a college teaching position. She worked at this and that, in 1934 marrying carpenter and labor organizer William 'Bud' Reynolds and having a daughter in 1935. In the late forties (which were also her late forties) Bud and Malvina worked together on progressive political campaigns and she performed at folk music events in the Los Angeles area, along with Earl Robinson and other musicians active in Peoples’ Songs (whose Bulletin was a forerunner of Sing Out! magazine). She had been writing the occasional popular or political song since her late thirties; by her fifties, she had increased her output and added children’s songs to the mix. By the time the folk protest movements of the 1960s came along, she had honed her skills and was ready to take on the issues of the day: civil rights, opposition to the war in Vietnam, and the right of workers to organize. Overall she wrote hundreds of songs, some of great beauty and many displaying a sense of humor and wit that has endeared her to performers and listeners from Helsinki to Tokyo. Malvina Reynolds died on March 17, 1978, with gigs on her calendar. Many of Malvina’s lyrics found elsewhere on the internet have been adapted by other singers. The words on this site, however, have all been double-checked with the original publications or manuscripts for correspondence to Malvina’s original words. Some typos may have escaped our scrutiny, though, so if you find any, please let us know. My guess is that my mother would have found going to a website and reading song lyrics somewhat artificial--not because it is a website (I think she would have enjoyed this way of communicating with so many people), but because on this site you are reading what should ultimately be heard, and moreover what should be heard sung, not spoken. When Malvina was a student at the University of California, she took a class studying the English ballads as though they were poems, with no music. She told the professor she thought that the ballads should be studied as they had originally been created. She volunteered to sing them to the class and the professor agreed. When she was a student teacher trying to teach poetic structures to high school students who showed little interest in poetry, she did use the words of current popular songs as her texts instead of poems, but these students all had the music in their heads already. If you come to this web site to be reminded of the words to a song you once knew, you will be in their position. But if you try to analyze lyrics of songs you have never heard sung, remember that something important is missing. E. Y. (Yip) Harburg, lyricist of 'Somewhere Over the Rainbow' said: "Words make you think a thought. Music makes you feel a feeling. A song makes you feel a thought." Such interpretations, and probably a dozen more of like kind, come so easily that it is difficult to dismiss this work as "just another children's song": it has a bit too much backbone. Notice in particular how Malvina concludes the song with the rather sobering lines: "Somewhere there is sunshine, somewhere there is day, Somewhere there is Morningtown, many miles away." Surely the deliberate use of the word "somewhere" here--three times, where it is absent in the earlier verses--does not help allay fears there might be storms to weather before the nirvanic destination (i.e., "Morningtown") is finally achieved? And what about this "many miles away" business: wouldn't the blind optimist rather hear that it's "just around the corner," or some such? From the perspective of her many years Malvina knew as well as anyone that "sunshine" and "day" are not givens in the voyage of life, they are earned. And yet the song seems hopeful. In the end it may indeed send a message that is--to a child anyway--warm and comforting, but we who sing this song to our children no longer find ourselves in this blissful place, and must individually decide how to face up to often troubling realities. Clearly, Malvina's own decisions involved cherishing what was good about the world, while not merely avoiding, or turning away from, what was not so good. One cannot ask more from one's heroes. All pages at this site Copyright 2006-2014 by Charles H. Smith and Nancy Schimmel. All rights reserved. Materials from this site, whole or in part, may not be reposted or otherwise reproduced for publication without the written consent of Charles H. Smith and Nancy Schimmel.